I don’t know if you guys have noticed, but I have never knit anything with a tweed yarn. Go ahead, check out the finished projects. No tweed yarns. But then I started lusting after Eunny’s Tangled Yoke Cardigan, which is knit with a tweed yarn, and all of a sudden I wanted to learn more about tweed. Coco Chanel popularized the use of tweed fabrics in high fashion? tweed yarns are more prone to felting? The third chapter contains stitch patterns with pictures of swatches knit up in tweed yarns. This chapter was especially useful to me, as a tweed newbie and fledgling knitwear designer, to see which patterns are made more interesting with tweed yarns and which patterns are strong enough not to be obscured by the tweed flecks. The last section is full of knitting patterns, grouped by skill level. There are 22 projects total, including hats, scarves, bags, sweaters, vests, pillows, and throws. Although all of my favorite projects below happen to be sweaters, sweaters make up less than half of the total pattern count. Pattern previews after the jump! Carrick Pullover. 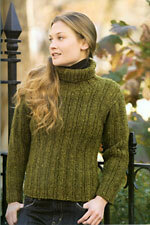 This pullover demonstrates exactly the kind of design that comes alive with a tweed yarn. We’ve all seen a hundred ribbed pullovers, but something about the tweedy flecks and the loose turtleneck makes me want to pull it on right now. This pattern is listed under Projects for Advanced Beginners. In coming up with additional Project Picks, I couldn’t choose between the two cabled sweaters below, so I’m opting to include both. The sweater on the left is the Moss Cabled Cardigan from Projects for Intermediate Knitters. The sweater on the right is the Isle of Skye Jacket from Projects for Advanced Knitters. Both sweaters have that inviting, home-y feel that I think is the essence of tweed. Both sweaters display the kind of attention to detail that I admire so much in patterns. Ribs flow smoothly into cables; the braids flanking the button band and side seams on the Isle of Skye Jacket are an especially nice touch. Chanel-Style Tweed Jacket. Although I’m not really a blue/orange person, I think this jacket is fabulous and it’s something I never would have thought would look so good in tweed. I love the brightly-colored trim and the detail at the cuff. The pattern as written doesn’t include any waist shaping, but it would be easy enough to add in. I think it would be a stylish addition to any wardrobe and would look great knit in a monochromatic color scheme. This jacket is also from Projects for Advanced Knitters. CogKnition posted this on April 7th, 2008 @ 1:34am in Book Reviews, Knitting for Charity, Knitwear Design, Life as a Knitter | Permalink to "Tweed"
I’ve never knit with Tweed either but that book looks like fun and I love the pattern for the pullover. Thanks for mentioning the ad space. I’ve been on spring break and my head outdoors.